Somewhat unseasonably cool weather sparked a desire in me to make soup . Generally, during the summer, I stick with cold soups. I love gazpacho, for example. Elise has an excellent recipe for it, though I like mine on the thick side, so I cut down on the tomato juice that she calls for. But the cool weather made me think of fall, which made the fact that this soup contains cranberries – something I associate with fall and Thanksgiving – particularly appealing. The original recipe called for adding beets, which I am not a fan of, so I simply used more cabbage. Red cabbage, red cranberry sauce and red onion. I must say that the simple ingredients blended well and it tasted great. It was also one of the prettiest soups I’ve ever eaten. Combine all ingredients in a large pot and stir to combine. 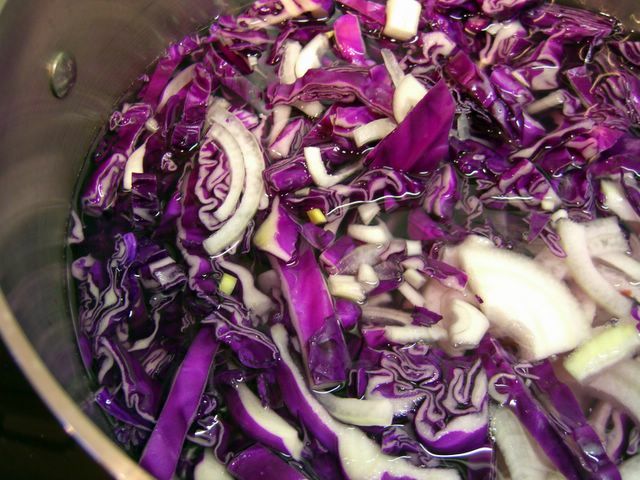 Bring to a boil and simmer until cabbage is tender. First off, I love your new banner. Someday, I’m going to try to get rid of my ol’ template! 2nd…..soup sounds interesting. I see your original version had beets, that one I’d like to see, I love beets!! Very different combo with the cabbage. I must try it. 3rd-ly….I’m afraid I tagged you for a meme…..if you aren’t ‘into’ them, pas problem! If so, I know we’d all love to read about your Favorite Childhood Food Memories. I agree, I love the new banner! Melissa – Thanks! I wanted to try something simple and see if I could work my way up from there. Some people have incredible art skills. I’m still sitting on the fence with the meme… we’ll see. The combination of ingredients here is unique and intriguing. I love to pair an ingredient you would associate with dessert with a savory meal. My newest post details coupling the sweet with the savory. Actually my whole blog more or less does this. I will try this recipe for sure! S.L. Plant – I love sweet and savory together, too. J – Thanks. The photo is of soup as I was just starting to cook it. By the end, everything was purple – including the broth. where did this recipe come from? what sort of taste did it have exactly? it does sound interesting! Violet – It came from the Joy of Soup. It tasted a bit sweet and it had a mellow, slightly meaty cabbage-y flavor. And it couldn’t be easier! Nic, love the new banner. Nice and simple and since you have that picture banner on the left it makes it really elegant. I also printed out a collection of soups from The Soup Lady that I hope to try now that the weather is getting cooler. Ana – I’m glad you like it! I have a whole “to try” list from the Soup Lady, myself. If you like gazpacho, try Lois’ recipe. Its a really nice summer meal. This looks delicious, I can’t wait to try it since cabbage (red especially) is my favorite veggie other then beets (I think I’ll add these to mimic the original recipe). Thanks!